Arboretum Wizard Walk children’s trail. My name is Laura Bush and I am the Senior Park Naturalist at Hunterdon County Division of Parks & Recreation. I grew up in Hunterdon County and have always enjoyed spending time outside, whether it be hiking, birding, biking, or sitting outside reading a book and watching the hummingbirds. I have been working at the Parks since January 2009. During that time, I have created a variety of nature programming for both children and adults. The Tot Walk series for 2- and 3-year-olds has become very popular. Each month I pick a theme, and participants enjoy a story, walk, and craft on that same topic. Spring Break Camp is a one-day nature camp and caters to kindergarteners through fifth graders. Adult backpacking trips are also a highlight of my job. I have a variety of nature interests, from native plants to insects to birding, and I am excited to bring a number of programs to the public. These programs change with the season and include guided seasonal walks, full moon hikes, and lectures on local wildlife. I am also proud to bring in some outside presenters for special programs. Past programs have included visiting a local eagle nest, lectures on insects or climate change, a lichen walk, and a van trip to the salt marsh at Sandy Hook. Starting in 2018, I began leading our annual Earth Day Festival at Echo Hill. This family event features activities like an animal show, recycled crafts, games, canoeing, hiking, local environmental organizations, an “April pole,” a drum circle, and a campfire & storytelling. No pre-registration required for this program—just stop in! However, “What do you do in the winter?” is one of my most frequent questions. There are still some programs in winter! Some brave souls will bundle up for a winter walk or Maple Sugaring, but we also have indoor programs. Winter is also when I have time for other tasks, including updating trail maps and brochures, editing the spring edition of the Hunterdon Parks Harbinger, creating new programs, organizing volunteers to monitor bluebird houses, and updating displays at the Arboretum. 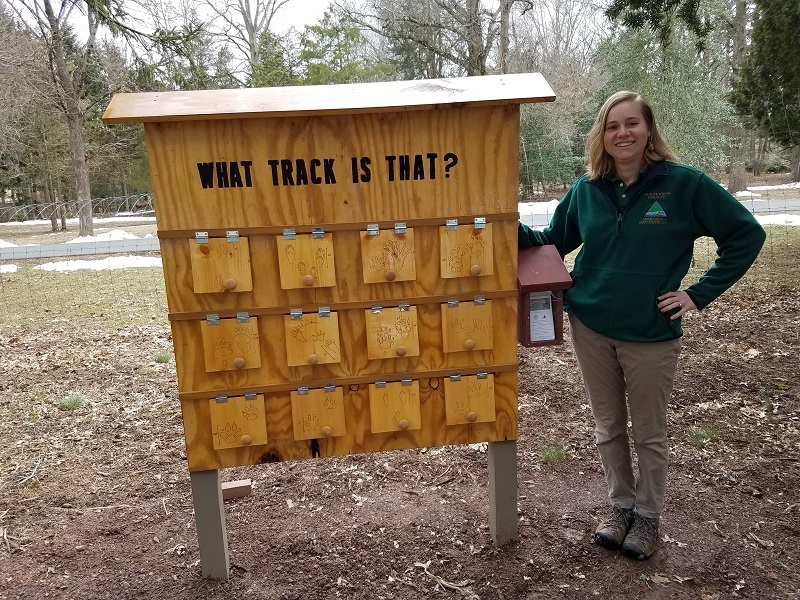 Year-round I also answer public questions about wildlife and advertise programs in any way we can think of: flyers, news websites, our monthly email blast, and facebook posts. In summer, I am the dedicated naturalist to field requests for programs from outside organizations, including camps and recreation programs, daycares, and senior centers. Some of the programs I offer are Seasonal Nature Walks, Incredible Insects, Birding, Pond/Stream Studies, Reptiles Alive, Nests & Eggs, and a variety of slide show lectures on wildlife, wildflowers, and trees. For a full listing of our programs, please see our brochure at: www.co.hunterdon.nj.us/depts/parks/brochures/programsforgroups.pdf. I also conduct these programs year-round. Many of our groups are schools, scouts, and garden clubs, but six or more people can be a group, even family and friends. Contact me at (908) 782-1158 or lkroon@co.hunterdon.nj.us to set up a program! Hunterdon County has 31 parks to explore, so I would encourage you to get out and enjoy what our area has to offer!